5th to 3rd centuries B.C.E. 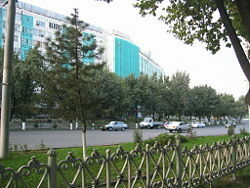 Tashkent (Uzbek: Toshkent, Тошкент; Russian: Ташкент, Turkish: Taşkent) is the capital of Uzbekistan and the Tashkent Province. The city was an important center for trade along the Silk Road and continues as a prominent export center to Eastern Europe for silk, cotton, textiles, and other products. Tashkent is the main economic and cultural center of Central Asia. It is located in the most industrially developed section of Uzbekistan. Few buildings from the city's ancient past remain, most destroyed as a result of the late nineteenth century Russian takeover, the Bolshevik Revolution, and a devastating earthquake in 1966. However, in 2007, Tashkent was named the cultural capital of the Islamic world by the Islamic Educational, Scientific and Cultural Organization in recognition of its efforts to "nourish Islamic culture and science, and pay careful attention to historical monuments … which have preserved theological works from the Islamic Renaissance era." As the capital of Uzbekistan, in the early twenty-first century the city had issues with the curtailment of human rights under the nation's authoritarian presidential rule, terrorism from Islamic militants, and economic stagnation. The city is a primary source of cultural pride for the nation. Its future prosperity depends on the willingness of the nation's leaders to establish basic civic freedoms and lead the country into economic and political stability. The view of the street near Darkhan. Tash, in the Turkic language, means "stone," while kand, qand, kent, kad, kath, and kud are derived from the Sogdian word kanda, which means "town" or "city." In medieval times, the town and the province were known as "Chach." Later, the town came to be known as Chachkand/Chashkand, meaning "Chach City." After the sixteenth century, the name was changed to Tashkand, which, as "stone city," was more meaningful. The modern spelling of Tashkent reflects Russian orthography. Tashkent is located on a well-watered plain to the west of the Altai Mountains on the road between Shymkent and Samarkand, at an elevation 1475 to 1575 feet (450 to 480 meters). It sits at the confluence of the Chirchik river and several of its tributaries and is built on deep alluvial deposits (up to 15 meters). Tashkent has a a typically continental climate with mild wet winters and hot dry summers. The average maximum daytime temperature in January is 37.4°F (3°C), rising to an average maximum of around 92°F (33°C) in July. Mean annual precipitation is 14.7 inches (375 mm). It is a lively tectonic area suffering large numbers of tremors and some earthquakes. Decades of environmental neglect during the Soviet era combined with skewed economic policies created an extensive environmental problem in the area. Aging factories pump unfiltered emissions into the atmosphere and contaminated waste into the water supply. The city is noted for its tree-lined streets, numerous fountains, and pleasant parks. An early map of Tashkent from 1865, showing the walls and gates. Tashkent began as an oasis on the Chirchik River, near the foothills of the Golestan Mountains. The principality of Chach had a main town with a square citadel built around the fifth to third centuries B.C.E., some five miles (eight kilometers) south of the Syr Darya River. By the seventh century C.E., Chach had over 30 towns and a network of over 50 canals, forming a trade center between the Sogdians and Turkic nomads. The region came under the sway of Islam in the early parts of the eighth century. Hsien-tsang (Xuanzang) mentioned the name of the city as Zhe-shi. The Chinese chronicles Sujshu, Bejshu, and Tanshu mention a possession called Shi or Zheshi with a capital with the same name since the fifth century C.E. Under the Persian Samanid dynasty (819–999), the city came to be known as Binkath. However, the Arabs retained the old name of Chach for the surrounding region, pronouncing it al-Shash instead. The modern Turkic name of Tashkent (City of Stone) comes from Kara-Khanid rule in the tenth century. Genghis Khan destroyed the city in 1219, although the great conqueror had found that the Khorezmshah had already sacked the city in 1214. Under the Timurids (fourteenth century) and subsequent Shaybanid (sixteenth century Uzbek) dynasties, the city revived, despite occasional attacks by the Uzbeks, Kazakhs, Persians, Mongols, Oirats, and Kalmyks. In 1809, Tashkent was annexed to the Khanate of Kokand (1709–1876). At the time, Tashkent had a population of around 100,000 and was considered the richest city in Central Asia. It prospered greatly through trade to Russia, but chafed under Kokand’s high taxes. The Tashkent clergy also favored the clergy of Bukhara over that of Kokand. However, before the Emir of Bukhara could capitalize on this discontent, the Russian army arrived. In May 1865, General Mikhail Grigorevich Chernyayev (1828-1898), acting against the direct orders of the tsar, staged a night attack against a city with a wall 15.5 miles (25km) long with 11 gates and 30,000 defenders. While a small contingent staged a diversionary attack, the main force penetrated the walls, led by a Russian Orthodox priest armed only with a crucifix. The Russians captured the city after two days of heavy fighting and the loss of 25 dead as opposed to several thousand of the defenders (including Alimqul, the ruler of the Kokand Khanate). Chernyayev, dubbed the "Lion of Tashkent" by city elders, abolished taxes for a year, rode unarmed through the streets and bazaars meeting common people, and appointed himself "Military Governor of Tashkent." 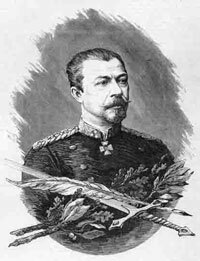 The Tsar rewarded Chernyayev and his men, but regarded the impulsive general as a "loose cannon," and replaced him with General Konstantin Petrovich Von Kaufman. Tashkent became the capital of the new territory of Russian Turkistan, with Kaufman as first Governor-General. A cantonment and Russian settlement were built across the Ankhor Canal from the old city, and Russian settlers and merchants poured in. Tashkent was a center of espionage in the Great Game rivalry between Russia and the United Kingdom over Central Asia. The Trans-Caspian Railway arrived in 1889, and the railway workers who built it settled in Tashkent as well, bringing with them the seeds of Bolshevik Revolution. With the fall of the Russian Empire in 1917, a provisional government attempted to maintain control in Tashkent. It was quickly overthrown and local Muslim opposition crushed. In April 1918, Tashkent became the capital of the Turkestan Autonomous Soviet Socialist Republic (Turkestan ASSR). The new regime was threatened by White forces, basmachi, revolts from within, and purges ordered from Moscow. Tashkent fell within the borders of the Uzbek SSR, and became the capital of the Uzbek SSR in 1930, displacing Samarkand. The city began to industrialize in the 1920s and 1930s, but industry increased tremendously during World War II (1939-1945), with the relocation of factories from western Russia to preserve the Soviet industrial capacity from the invading Nazis. Evacuees from the war zones increased the population to well over a million, including numerous Russians. On April 26, 1966, a huge 7.5 on the Richter scale earthquake destroyed Tashkent, leaving over 300,000 homeless. Since 1991, the city has changed economically, culturally, and architecturally. The largest statue ever erected for Lenin was replaced with a globe, complete with a map of Uzbekistan. Buildings from the Soviet era were replaced with modern buildings, such as the 22-story NBU Bank building, an Intercontinental Hotel, International Business Center, and the Plaza Building. 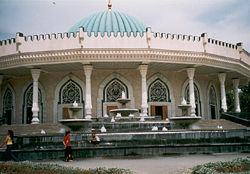 In 2007, Tashkent was named the cultural capital of the Islamic world  as the city is home to numerous historic mosques and religious establishments. Uzbekistan is a republic noted for authoritarian presidential rule, with little power outside the executive branch. The country is divided into 12 provinces (viloyatlar). Tashkent is the capital of the Tashkent Viloyati (Province), which is divided into 15 administrative districts. Tashkent, which is also the capital city of the nation of Uzbekistan, is governed separately from the province as an independent city. Uzbekistan has issues with terrorism by Islamic militants, economic stagnation, and the curtailment of human rights. 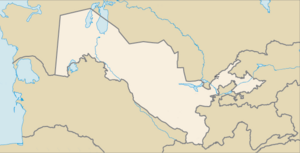 Tashkent has been the target of several terrorist attacks since Uzbekistan gained independence. Uzbekistan, in 2008, was the world's second-largest cotton exporter and fifth largest producer, relying heavily on cotton for export earnings, along with gold, natural gas, and oil. Uzbekistan's per capita gross domestic product was estimated at US$2400 in 2007. Tashkent is the main economic and cultural center of Central Asia, and is located in the most industrially developed part of Uzbekistan. Much of the city's industry is involved with the manufacture of agricultural and textile machinery, and production of cotton textiles. It also has various food-processing industries. The city exports to Eastern Europe; silk, cotton and textiles, as well as oil, coal, copper, sulfur, rice, and manufactured products such as television sets, automobiles and tractors. Media outlets include nine Uzbek language newspapers, four in English and nine publications in Russian. There are several television and cable television stations. The Tashkent Tower is the tallest structure in Central Asia. Tashkent province has over 223 miles (360 km) of railways and 2,343 miles (3771 km) of surfaced roads. Tashkent city had the only metro system in Central Asia in 2008, since those at Astana and Almaty were under construction. Tashkent International Airport, located 12 miles (20 km) from the center of Tashkent, remains the main airport of Uzbekistan and the largest airport in Central Asia. Tashkent was the most cosmopolitan city in Uzbekistan in 2008, with a large ethnic Russian minority. The official population in 2006 was 1,967,879, although the unofficial figure was three million. Tashkent has a multicolored mixture of different ethnic groups. Dark-haired Uzbeks make up 80 percent of Uzbekistan's population, while Russians make up 5.5 percent, Tajiks 5 percent, Kazakhs 3 percent, Karakalpak 2.5 percent, Tatar 1.5 percent, other 2.5 percent. Most speak Uzbek (74.3 percent), while 14.2 percent speak Russian, 4.4 percent Tajik, and 7.1 percent speak other languages. Most (88 percent) are Sunni Muslims, 9 percent are Eastern Orthodox, and the remainder adhere to other religions. 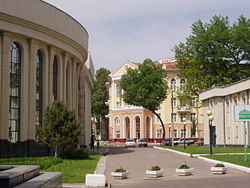 Tashkent's institutes of higher education and research include the the National University of Uzbekistan, the Tashkent State Economic University, the Tashkent State Institute of Law, the Tashkent Institute of Finance, the Tashkent State Technical University, the Tashkent University of Information Technologies, the Tashkent Automobile and Road Construction institute, the International Business School, the Westminster International University in Tashkent, the University of World Economy and Diplomacy, the State University of Foreign Languages, the Conservatory of Music, the Tashkent State Medicine Academy, the Institute of Oriental Studies, and the Tashkent Islamic University. Kukeldash Madrassa, which dates back to the reign of Abdullah Khan (1557-1598) was being restored in 2008. There was talk of making it into a museum, but it was being used as a mosque. The Telyashayakh Mosque (Khast Imam Mosque), which contains the Uthman Qur'an, considered to be the oldest extant Qur'an in the world. Dating from 655 and stained with the blood of murdered caliph Uthman, it was brought by Timur to Samarkand, seized by the Russians as a war trophy and taken to Saint Petersburg. It was returned to Uzbekistan in 1989. The Yunus Khan Mausoleum is a group of three fifteenth century mausoleums, restored in the nineteenth century, the largest of which is the grave of Yunus Khan, grandfather of Mughal Empire founder Babur (1483-1530). The Palace of Prince Romanov, which was the palace of Grand Duke Nikolai Konstantinovich (1850-1918), a first cousin of Alexander III of Russia, who was banished to Tashkent for some shady deals involving the Russian Crown Jewels. 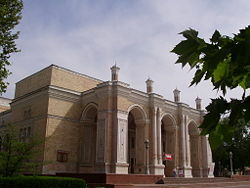 The Alisher Navoi Opera and Ballet Theatre, which was built by the architect who designed Lenin's Tomb in Moscow, Aleksey Shchusev, and built with Japanese prisoner of war labor during World War II. This theater hosts Russian ballet and opera. 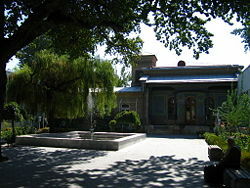 The Fine Arts Museum of Uzbekistan, which contains a major collection of art from the pre-Russian period, including Sogdian murals, Buddhist statues and Zoroastrian art, along with a more modern collection of nineteenth and twentieth century applied art, such as suzani embroidered hangings. Of more interest is the large collection of paintings "borrowed" from the Hermitage by Grand Duke Romanov to decorate his palace in exile in Tashkent, and never returned. Behind the museum is a small park, containing the neglected graves of the Bolsheviks who died in the Russian Revolution of 1917 and to Ossipov's treachery in 1919, along with first Uzbekistani President Yuldush Akhunbabayev. 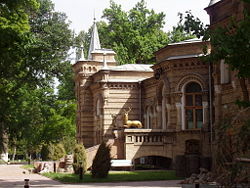 The Museum of Applied Arts, which is housed in a traditional house originally commissioned for a wealthy tsarist diplomat. The house itself is the main attraction, rather than its collection of nineteenth and twentieth century applied arts. The Amir Timur Museum, which is an impressive building with a brilliant blue dome and ornate interior. Inside, the exhibits of Timur and of President Islom Karimov vie for the visitor's attention. 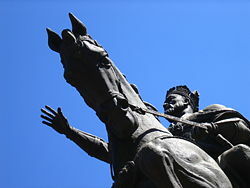 The gardens outside contain a statue of Timur on horseback, surrounded by some of the nicest gardens and fountains in the city. The History Museum, which is Tashkent's largest museum, and is housed in the ex-Lenin Museum, has on display one of the 12 gold keys delivered by representatives of the Tashkent nobility to the Russian camp on June 30, 1865, in recognition of the Russian victory. Tashkent is the main economic and cultural center of Central Asia, and is located in the most industrially developed part of Uzbekistan. It was the most cosmopolitan city in Uzbekistan in 2008, with a large ethnic Russian minority. Despite waves of destruction that have left few ancient buildings standing, the 2,000-year-old city was named the cultural capital of the Islamic world as the city is home to numerous historic mosques and religious establishments. Tashkent's famous buildings could attract a steady flow international visitors each year, which could be a goldmine for the city's economy. But as the capital of Uzbekistan, the city has issues with terrorism by Islamic militants, economic stagnation, and the curtailment of human rights under the nation's authoritarian presidential rule. The city is a source of cultural pride for the nation, however its future prosperity depends on the willingness of the nation's leaders to raise the country from economic despair and establish freedom and stability. ↑ 1.0 1.1 Vasilina Vasilyeva, Tashkent Touts Islamic University, Moscow News Weekly. Retrieved October 21, 2008. Bulatov, M., and T. F. Kadyrova. 1977. Tashkent. Leningrad: Aurora Art Publishers. OCLC 5205615. Sahadeo, Jeff. 2007. Russian Colonial Society in Tashkent: 1865-1923. Bloomington: Indiana University Press. ISBN 9780253348203. World Fact Book. 2008. Uzbekistan. Retrieved October 9, 2008. This page was last modified on 17 November 2015, at 15:44.